When I set out on Sunday morning, my purposes were two. First and foremost, I wanted to get back in shape from my recent ankle injury by doing some cycling along a section of the lovely C&O Canal Towpath. It is 180-odd miles long and runs along the Potomac from Washington, DC, far into the western mountains of Maryland (yup, we have mountains) to Cumberland. The canal is mostly dry and filled with trees now, but the towpath remains and is popular with runners, cyclists and horse traffic. But my second purpose was to scout out caves. 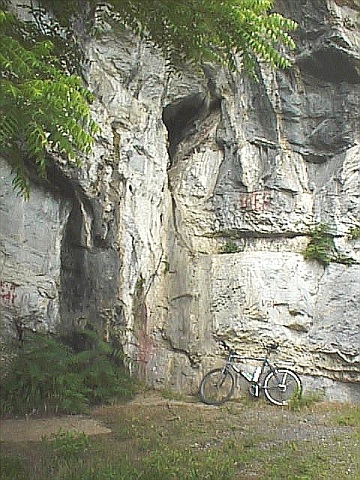 In previous cycling trips along the C&O Canal, I've noticed several cave entrances in the cliffs along the way. Maryland is not a state known for its exceptional caves, unlike the neighboring Virginias or even Pennsylvania (though we do have more caves than Delaware!) Our caves also tend to be quite small, but to quote Master Yoda, "Size Matters Not". First the cycling: I started at Dam #4 at about Mile 84 on the towpath. Unfortunately, the towpath between miles 86 and 88 was damaged during a flood and is "not passable". Large signs proclaim this which I choose to ignore. I cycled over increasingly narrow, overgrown trail until I came to a point where the cliffs on one side converged with the river on the other side. A few feet of dense, poison-ivy-choked shrubbery stuck tenaciously to the few feet of space between the two. OK! So the way really is closed! I retreated back to Dam #4 and took the five-mile detour up and over the surrounding country roads to McMahon's Mill at Milepost 88. The day was lovely and warm, but not too hot, with a good breeze and bright sun. Perfect for cycling. Once the route descends back to the river, I was in the section known as the Big Slackwater. The river was calm enough here that the canal diggers hadn't bothered to blast their way through the hard limestone cliffs. Boats were shunted out into the calm river for a few miles and mule-powered motive force walked along a nice path at the edge. There were a few miles of lovely waterfront realestate with cliffs on the other side. I met two rock climbers scaling a nice-looking 50' cliff; have to come back here when my foot is healed and try it out. There were also numerous cliff openings which I checked out. I'll describe these all together at the end. The canal came back into being and I spent most of my time winding through nice, dense forest interspersed with views of the river on one side and fields on the other. Not many people were about in the relatively isolated stretch of the canal. The day wore on and I realized that two months of convalesence have left me pathetic and weak! By five, I reached Williamsport and turned around just past mile marker 100. More than half-way done with the Canal! With an aching knee and sore rump, I turned for home and got back without incident. Total milage: about 45 miles. Now I'll discuss various of the caves I've seen along the canal, some from this trip, others from a previous trip. 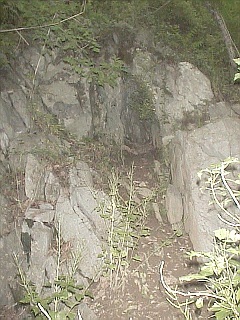 (Towpath Mile ~89) Near McMahon's Mill, are a series of cave openings in the impressive cliffs overlooking the Potomac. These are the Howell Caves, the largest of which sports a couple hundred feet of passage: belly crawl interspersed with a couple formation-filled rooms. Upstream, the smaller Little Howell Cave opens on a cliff 15' above the ground. Several other promissing-looking openings go in 5-10 feet before pinching down to sub-human proportions. The cave entrance is hard to miss sitting under a large overhang in the cliff. While the big feature in the upper right looks attractive, the actual entrance is that low crawl in the lower left. 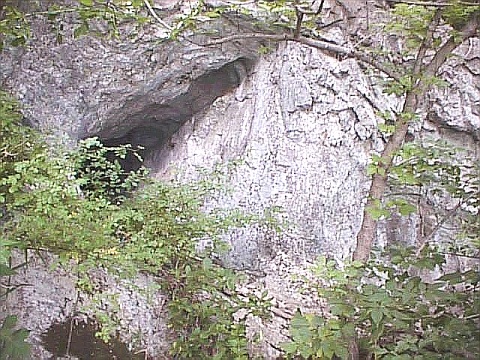 Little Howell Cave (left) is about 15' off the ground. Access is by climbing the rock or trusting the manky-looking cable tied to a peice of rope. Your call! 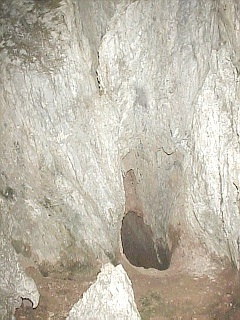 Littler Howell Cave (right) goes only about 10 feet before pinching out. There are several other similar opening along the cliffs in the region. 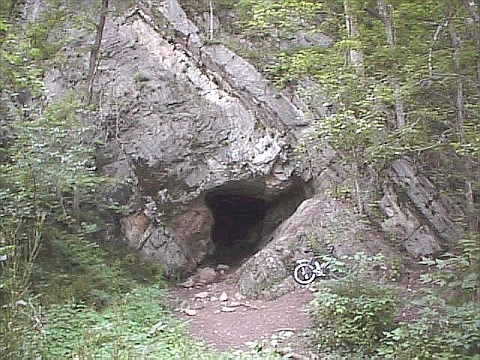 Dam #4 cave (also called Bear Cave) is an impressive-looking cave with a large, obvious, "Hollywood" entrance (left). In wet weather a stream emerges from the cave. The total passage length is a few hundred feet and a bear could easily be hiding in any corner of it! 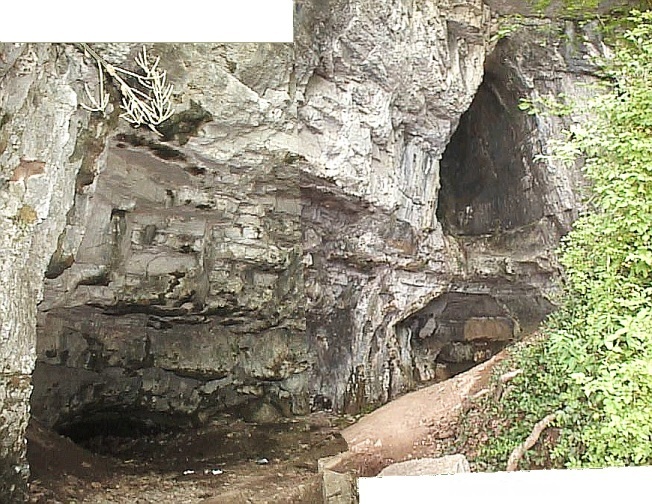 The photo on the right shows where a pool is located about 50' inside the cave. 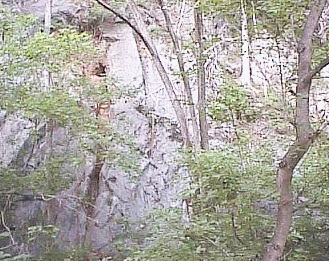 Several promissing-looking holes are seen in the cliffs just upstream from Dam #4 Cave. A triangular entrance (left) proved impassable for humans after about ten feet. 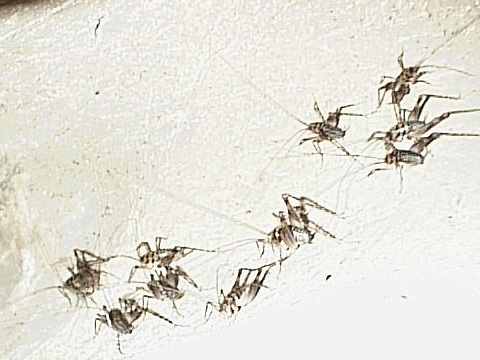 But a healthy supply of cave crickets (below) suggests it goes deeper. A bright red streak leads from a small entrance high on another cliff (middle) but was inaccessible. A larger hole was seen closer to ground level obscured behind the triple tree trunks in the photo. This hole (right) went in a five feet as 18" diameter tube before plunging downward at a steep angle to end in mud. Digging might reveal more cave, but it's probably not worth it. Some healthy-looking cave crickets roughly actual size. Crickets like this are uncommon in the nearby WV caves and I was surprised to find so many here. Two caves are found around milepost 75.5 near Snyders Landing. 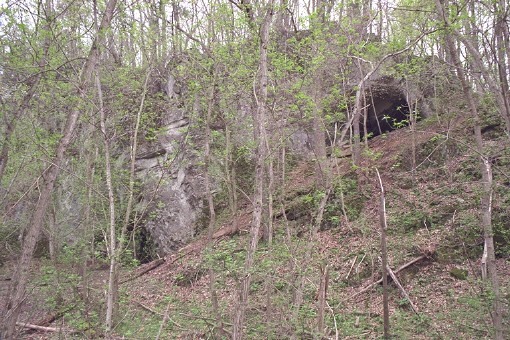 Snyders Landing Cave #1 is about 120 feet long. Snyders #2 has three entrances which all connect with great difficulty. The cave is mostly narrow crawlways. 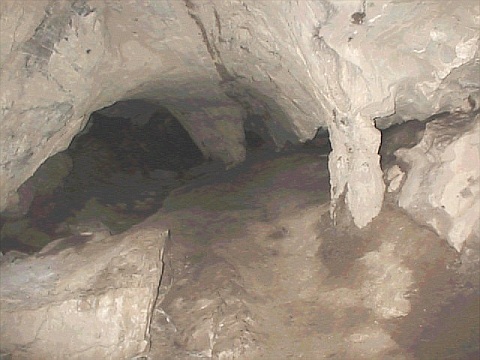 A large flowstone mass (right) can be found immediately inside the largest entrance. 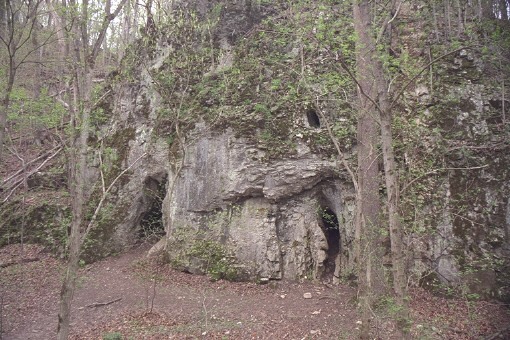 Killiansburg Cave, a pair of large rock shelters, is located just downstream from the Snyders Landing caves. Townsfolk from nearby Sharpsburg sheltered here on September 16-18, 1862, during the Civil War.